You print other companies’ newsletters; why not print your own? You spend your workdays at the bindery printing newsletters for small local businesses, major companies, and non-profits—so do you print your own? Many binderies and print shops miss out on a huge marketing opportunity by not printing a newsletter. Your online counterparts are advertising in the mail, so why aren’t you? Here are some of the top reasons that you should consider printing a newsletter. This might sound silly, but printing a newsletter reminds your past and present customers that you exist. You might not get consistent business from many of your clients, especially if they don’t have a high volume of printing needs. However, if you frequently mail them physical reminders that you exist, you will be the first company that they think of when the next job arises. Just like a newsletter reminds past customers that you exist, a newsletter can replace cold calling to let potential customers know that you exist. Many businesses find that once they start mailing newsletters to companies that they want to do business with, those companies will reach out and eliminate cold calling altogether. Most printing companies and binderies do not mail out newsletters, so printing a newsletter is a fantastic way to set yours apart. The extra effort, interesting content, and newsletter-specific deals will automatically set you apart from competitors who aren’t doing the same. Your newsletter can also lead to an increase in web traffic, where customers will again see the many things that set your business apart. 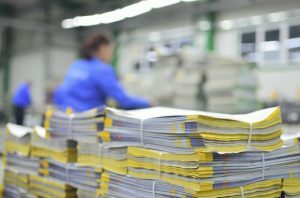 Obviously, you aren’t going to use the highest quality paper and premium bindings for your newsletter, but, they are a great way to show off the quality that your bindery produces to potential customers. You tell your marketing clients that they need printed newsletters for their business, so lead by example and show off your business! This entry was posted on Thursday, January 19th, 2017	at 3:28 pm	and is filed under industry practices	. You can follow any responses to this entry through the RSS 2.0	feed. Both comments and pings are currently closed.